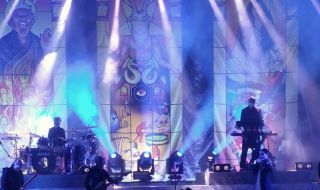 Ghost's North American Popestar tour utilized 11 High End Systems SolaSpot Pro 2000 fixtures as the floor lighting package. Operated by Lighting Director Mike Holm and supplied through Gemini Lighting Sound Video, the SolaSpots serve as powerful workhorses, providing massive looks and special effects lighting to the band’s high energy live performances. The designer originally specified the SolaSpots while Ghost was touring in Europe.